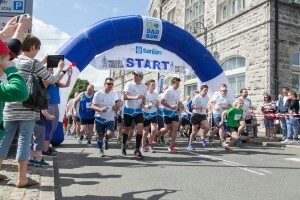 Colin Jackson delighted with the Sanlam Go Dad run in Llangefni | News by Wales Express News, People Before Profit! Former world champion athlete Colin Jackson was delighted at the success of the Sanlam Go Dad Run 5K in Llangefni yesterday. Almost 100 men and boys started at the Town Hall and ran around the streets of the town to raise awareness of and funds for Prostate Cancer UK. First home was one of the top young runners in Wales, 12 year old Osian Perrin, and he was followed by Jason Thomas and Daniel Jones, all of whom won TIMEX Ironman watches as well as receiving their Sanlam Blue Y’fronts, medal, PUMA T-shirts and Big Yellow Sports Goodies Bags. The pilot event was staged in Llangefni in 2013 and this year there are also events in Worcester, Warrington, Bristol, London and Cardiff. 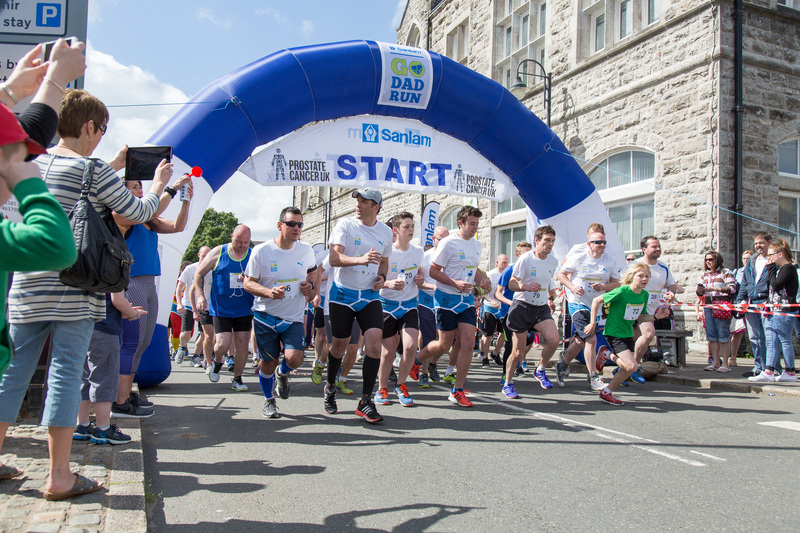 Runners at the start of the Sanlam Go Dad Run event in Llangefni yesterday. Photo by Mel Parry Photography.